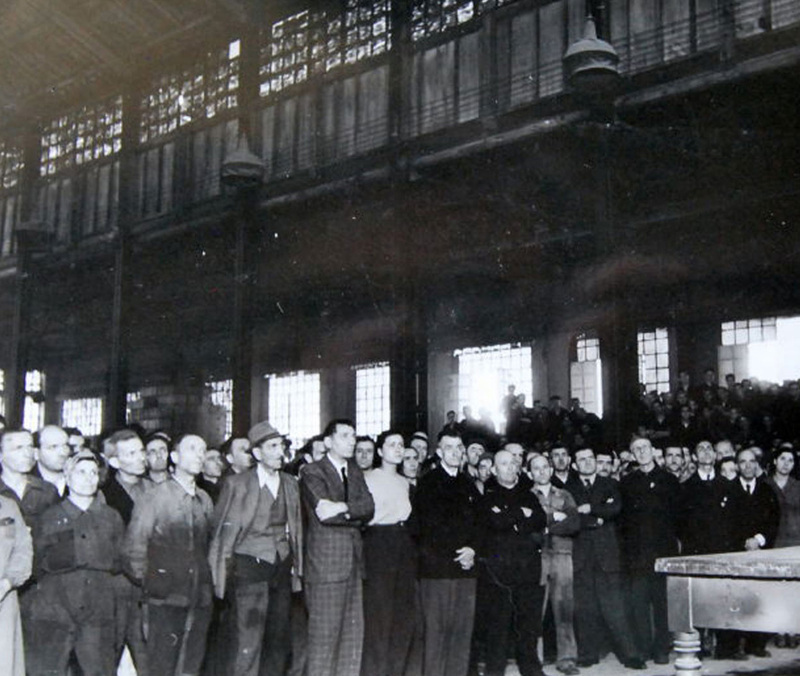 Many of the major archival sources which would have been of primary importance to the study of forced labour in Italy during the Second World War are missing. Some were destroyed as a direct result of the war (during air raids or transfers), whilst others were intentionally eliminated at the end of the war so as to leave no evidence of responsibility for war crimes. Therefore researchers desirous of studying forced labour in Italy and Germany during the Second World War cannot consult a specific group of records or a central archive but must work their way laboriously through a large number of collections in order to identify the documentation relative to their research. This general observation applies in particular to the records of the Todt organization (OT) which, as is known from publications the subject,1 made extensive use of forced labour in the occupied regions and in the Großdeutsches Reich. At the end of 1944 it employed about 1,360,000 workers, of whom only 60,000 were German.2 The records of the Todt held in the Bundesarchiv in Berlin (Collection R50I3) include only 3962 items, a ridiculously low number considering the enormous amount of documentation produced by the institution during its existence (1938-1945). In many cases this scheme existed only on paper and the actual administrative organization remained rather more complex. In any case, of the numerous Oberbauleitungen and Einsätze existing in Italy (all subject to the Einsatzgruppe Italien und Alpen and the Einsatzgruppen Alpen VIII, active in the Pre-Alps), the Federal Archive of Berlin only holds records from the OBL Tessin and the Einsatz Seefalke and very few belonging to the EG Alpen VIII. However, some relevant documentation can be found in other parts of the collection, for example in documents referring to the central organisation, and also in the series belonging to the former OT Office OBL Ostfriesenland. This contains documents appertaining to various companies that worked for the Todt, including some that operated in Italy. For example, among this material – which consists mostly of accounting documents which supported requests for payment of expenses for work performed - was found a list of civilian internees (Zivilgefangene) interned at the Vigarano camp, together with information on the camps at Poggio Renatico and Ferrara Ponte (file R50I-693). Several files in this section of the OT fund contain lists of wage earners (Lohnlisten), in many instances Italians working for Todt in Germany or in the regions occupied during the war. Apart from the above mentioned example, the Lohnlisten give the names of workers but do not specify whether they were forced labourers, and apart from their names and the calculation of the hours worked - necessary to establish their pay - they do not furnish other information. It is generally difficult to determine if, in the places mentioned in the records found in this collection, the workers were coerced or voluntary. In fact, there are several documents relating to labour camps contained in the Todt records (R50I-185), for example ground plans of the Barackenlager at Malpensa and Lonate. However, the documents do not give any indication as to the status of the workers who lived there. Were they forced labourers or workers who had enlisted of their own free will? An interesting case is that contained in a report on a Durchgangs-u. Sammellager (transit camp), established in January 1944 in Via Nomentana in Rome, which gives interesting information about the camp. The report complains about the fact that there were few labourers, given that some who had signed a contract had not materialised, and specifies that the Italian police would search for the people concerned and would force them to work. In short, like many other German organizations, the Todt was set up to supply workers who had volunteered their services, but as is well known, in many cases this was a pure facade, concealing behind it the phenomenon of forced labour. A second set of records of interest to students researching forced labour under the Todt is that of the Reichsminister für Rüstung und Kriegsproduktion (R3), Dienststelle des Generalbevollmächtigten für Italien. Unfortunately, even here there are only a few documents relating to the recruitment of workers in Italy. Among other records of possible interest which have yet to be consulted is the collection, unfortunately also very small, which relates to the German police authorities in Italy (R70, Deutsche Polizeidienststellen in Italien). In a similar collection relating to the Netherlands, R70-Niederlande, it is possible to read the interesting outcome of an interrogation of Dutch workers regarding the conditions in the Berlin Schlachtensee camp. Given that Italian records show that some Italians were deported to this camp a few months afterwards, the document is a useful source of information on the camp. Interesting documents have also been found scattered throughout collections apparently not related to the subject, such as the that of the Wirtschaftsgruppe Bauindustrie (Building Construction Industry R13 / VIII) which during the war was directly involved in importing labour from the occupied regions. Although many were lost during the war, there are more military documents to be found in these archives than civilian ones. The most interesting collections from which to obtain information regarding the Todt are the Wehrmacht headquarters reports, produced by units operating in the rearguard rather than on the front line, particularly relevant are the collection of the General Plenipotentiary of the German Wehrmacht in Italy (Bevollmächtigter General der Deutshen Wehrmacht in Italien: RH 31 VI) and the reports of the Militärkommandanturen operating in Italy (contained in the RH 34 and RH 36 collections). Moreover, the latter are particularly useful, as the Militärkommandanturen submitted monthly reports on the state of the provinces under their jurisdiction. These reports include information on the relationship between the German and Italian authorities, the mood of the population, price fluctuations and, more interestingly as regards this study, job recruitment. The section of these reports dedicated to work is not just about work for the Germans but the general state of working conditions in the provinces. Naturally the Germans paid special attention to the recruitment of workers for the Wehrmacht. These reports are therefore a very precious source of historical information, not only as far as work for the OT is concerned but also with regard to the Italian society of that period. The series is complete until the summer of 1944. There is a patchy coverage of the period from September 1944 onwards, and for the last period of the conflict they are entirely missing. Other information about work in Italy is occasionally to be found in the military headquarters reports given by units operating in Italy, especially those of the Armeeoberkommando 10 and 14 (RH 20/10, RH 20/14) of which a fairly large number exist for 1944. Finally, the divisional headquarters' reports for those units operating in Italy are relevant. Some of the best conserved reports are those of the Hermann Göring Division (RH 32). The best publication on Italy is still L. Klinkhammer, L'occupazione tedesca in Italia 1943-1945, Torino, Bollati Boringhieri 1993. See also: Quellen zur Geschichte der Organisation Todt, hrsg von Hedwig Singer, Osnabrück 1987-1998 in 4 vol. : vol. 1/2: Singer, Hedwig, Entwicklung und Einsatz der Organisation Todt (OT)/ Dittrich, Rudolf: Vom Werden, Wesen und Wirken der Organisation Todt/Dorsch, Xaver: Die Organisation Todt, Osnabrück 1998; vol. 3: Böhm, Klaus: Die Organisation Todt im Einsatz 1939-1945, dargestellt nach Kriegsschauplätzen auf Grund der Feldpostnummern, Osnabrück 1987; vol. 4: Handbook of the Organisation Todt, Reprint of the ed. London March 1945, Osnabrück 1992. Seidler, Franz: Die Organisation Todt. Bauen für Staat und Wehrmacht 1938-1945, Koblenz 1987, F. Lemmes, The Economics of the German Construction Programs in Occupied France and Occupied Italy, 1940–1945, in J. Scherner - E. White (Eds. ), Paying for Hitler's War: The Consequences of Nazi Hegemony for Europe, Cambridge: Cambridge University Press 2016, pp. 164-197. The catalogue of documents held in the Bundesarchiv - Berlini Lichterfelde can be seen on the website of the Bundesarchiv at : https://invenio.bundesarchiv.de/basys2-invenio/login.xhtml. Handbook of the Organisation Todt, London March 1945, p. 3.